Our fonts contain different sets of numbers. The default are the Table Numbers, (Fig: 1st line). They are all the same width so that in tables all digits are aligned in clean columns. This figures also exists as a Proportional Numbers (Fig: 2nd line). Here all numbers have the perfect optical width. The 1 is thinner, for example, than the 8. This looks practically better than the monospaced set, but in tables this set of numbers would of course not align into neat columns. In longer texts one might want to use Medieval Numbers (also known as minuscle numbers), which will better harmonize with the alphabetical glyphs because of their different ascenders and descenders. Such as the standard numbers the medieval ones also exist as monospaced (Fig: line 3, thin zero because of the thin monospace) and proportional with different widths (Fig: line 4). Libertine Fonts contain different sets of stylistic alternatives for example to change German capital umlauts Ä, Ö and Ü (where the dots are nearer to the glyphs) to tremas (ss01-style-set). The ss02-style-set uses more flexible forms of some capitals, such as of K and R.
Via the salt-table, nearly all glyph-variants can be shown but needed to be selected separately. An example for this behavior is the new German Versal-Eszett, that is being used automatically with capitalization or small caps. Those who do not want this behavior can have the Versal Eszett substituted by SS by using the salt-table. In some scripts there are special glyphs for word-endings. For example there is a word-ending-sigma in the Greek alphabet. Because Greek keyboards have both characters available, the fina-table will only substitute the innerword-sigma against the word-ending-sigma for all languages but Greek – fina. For many scientific publications superiors and inferiors are needed. Linux Libertine contains all numbers, as well as the entire basic Latin alphabet, in their optimized superior and inferior forms. 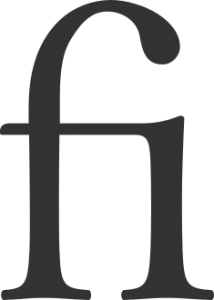 Additionally, the plus and the minus glyph, among many others are included. This genius kind of technique allows the substitution of certain characters in a defined surrounding. In the latin alphabeth this is especially useful in case of the minuscle f, whose long characteristic overbording neck can collide with a following question mark, a closing bracket, accented minuscles etcetera. The figure shows typical collisions in red. 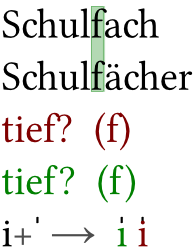 To prevent this cases, Libertine Fonts also provide a short-necked f. In case of a problematic pairing the regular f is substituted in favor of the short-neck one (green).